After a super late night partying with family, Madison spent the day in her pj’s playing around the house with Carter & Stitch. 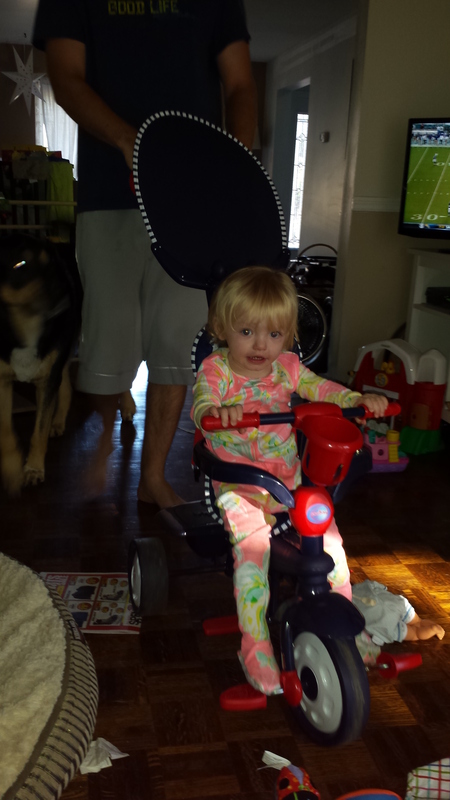 She decided she wanted to race Carter around the house on her bike. With the help of Dada she did many laps. She can almost touch the pedals herself! A reminder that the Mike Gregoire Memorial Golf Tournament is one week away! Thank you to everyone who has registered for either golf or dinner. The silent auction items are also looking really good. We are looking forward to seeing everyone there!